Hello and welcome to exampundit. 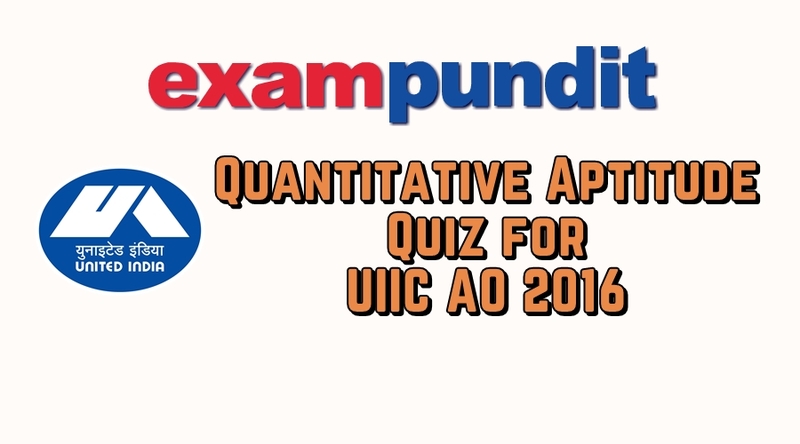 Here is a set of Quantitative Aptitude Quiz for UIIC AO 2016. In case the options are ABCD, use the Appropriate Options. If you have any doubt regarding any question of the quiz, kindly ask after the quiz is over i.e answers given. Do Not CHAT here. If you have any query, use today’s Ask The Mentor Page. At least 8 Attempts for Scores. Exampundit.in reserves the right to choose winner or give scores. interest accrued on an amount of Rs. 3. 6 women and 6 men together can complete a piece of work in 6 days. complete the same work if 9 women alone can complete it in 10 days? at the end of 7 years, how much money did he borrow? square whose perimeter is 112 metres? than C. What is C’s share in the amount? the average speed of the car? days by working for 5 hours a day.